Windlab (ASX: WND) is a global renewable energy development company, focusing principally on harvesting wind energy. The business is a leader in the development, construction and operation of wind farms throughout the world. WND is particularly active in pursuing wind farm developments within Australia. Its immediate priority is a JV with Eurus Energy to develop Phase 1 of the Kennedy Energy Park in Queensland. Elsewhere, Windlab has developed projects in South Africa and North America, where geographical expansion is anticipated. The company is an exclusive user of Windscape, an “atmospheric modelling and wind assessment” tool used for wind farm prospecting in various geographies. This technology was developed by Windlab’s founder at the CSIRO. Thus far, Windlab has developed 580MW of operating capacity through completed projects in 3 continents. A further 48 projects form a development portfolio with capacity of 7,219MW. Of this, 10 projects have already received development approval, accounting for 1,333MW. Last year, renewable energy exceeded 55% of new net generation capacity. It also marked the second year running where renewable growth formed the majority. By 2040, experts predict a 60% increase in global electricity demand, with three quarters via renewable sources. 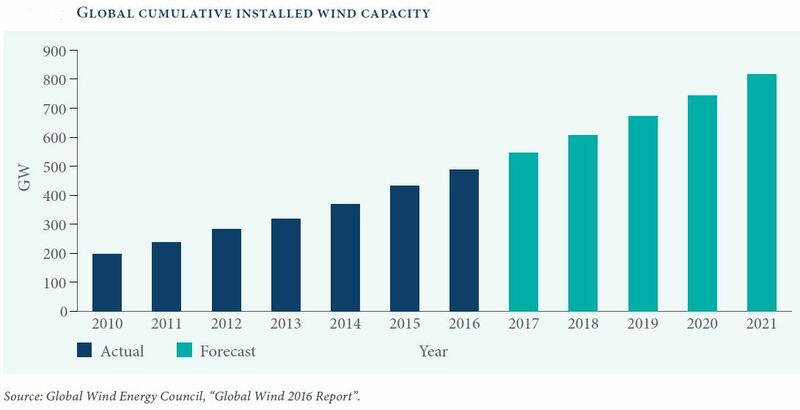 Between 2016 and 2021, installed wind capacity is expected to increase by over 80% (Figure 1). Generating wind energy via turbines is considered to be the cheapest form of renewable energy. It is also viewed as cheaper than traditional production methods like coal-fired power stations. With wind turbines becoming increasingly sophisticated, unit production costs have decreased. As wind energy generally peaks at night, and solar energy peaks during the day, the two renewables are not necessarily seen as like-for-like replacements. Unlike fossil fuels, wind generation incurs negligible marginal costs in the eastern and southern markets of Australia (the NEM). Thus, wind generators may increase their electricity output at the spot rate by bidding a price of zero. 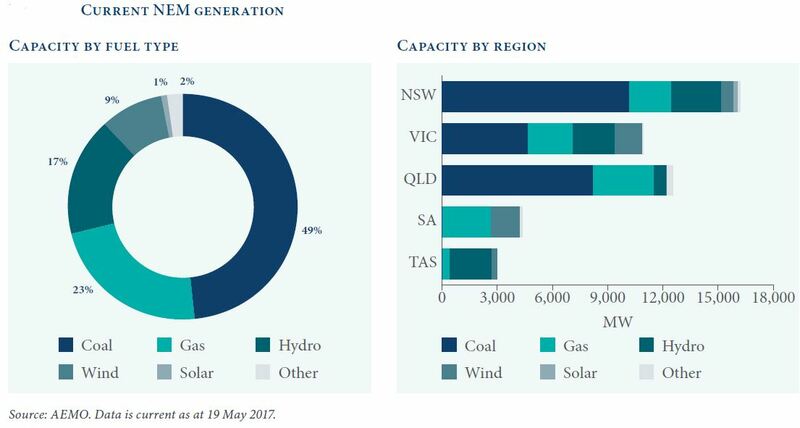 Approximately 9% of capacity in the NEM is wind generated (Figure 2), predominantly in NSW, Victoria and South Australia. Notable coal generating projects have been decommissioned in these states. Windlab expect further decommissioning of projects approaching the end of their design life. 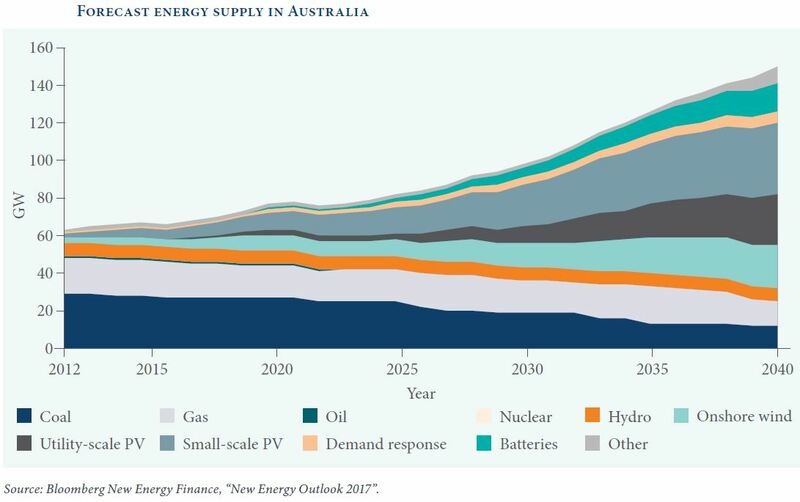 Across Australia, renewables are set to take on a growing role in supplying energy (Figure 3). This is largely due to policies resulting from the Federal Government’s commitment to the Paris Agreement. The government is eyeing a “reduction in greenhouse gas emissions of 26-28% on 2005 levels by 2030”. Also supporting this are State targets in Queensland, ACT, South Australia and Victoria. The Sub-Saharan Africa market is considered the “most electricity poor region in the world”. Many lack access to electricity, or reliable services. Underdevelopment is compounded by limited capacity growth and forecasted demand increasing fourfold by 2040. Recent policy development and investment suggests some African governments, including major coal producer South Africa, are open to renewables. The $50m IPO is fully underwritten by Moelis. 12.5m new shares will be issued by Windlab at $2 each, and existing shareholders will transfer 12.5m shares at the same price to new investors. The deal includes an institutional offer, broker offer, and Chairman’s List offer. Given the IPO structure, the majority (50%) of funds will go towards selling shareholders. Remaining proceeds will support the Kennedy Energy Park JV and IPO costs. Windlab develop onshore wind projects in the eastern and southern regions of Australia (the NEM). This region is considered to be the largest wholesale market. International markets, particularly Sub-Saharan Africa, feature prominently among longer term plans. Figure 5 illustrates the company’s development portfolio. Phase 1 of the Kennedy Energy Park, which Windlab holds a 50% interest, will initially offer 58MW. The second stage has been supported by government infrastructure investment, and will provide 1,258MW upon completion. The renewable energy developer also has commercial interests in multiple projects in its development pipeline. Among existing projects, Coonooer Bridge is operating well above the local industry’s average for capacity (34%). With a capacity factor of 46%, the project has been the country’s leading wind farm. Windlab also has equity interest in the Kiata Wind Farm, which is due to be built by December 2017, and a commercial interest in the West Coast One project in South Africa. In recent years, Windlab has transitioned from being a developer into a whole-of-life operator. This is through asset management contracts and various levels of project ownership interests. The North Queensland market is a central part of Windlab’s strategy. This is based on the government’s current subsidisation to provide energy to the region. The company believes generating energy closer to end users can save the government costs. Windlab already owns a large majority of the “scarce” wind resources close to the electricity network in Queensland. According to the company, a large degree of its success is attributable to its proprietary technology, Windscape. Originating from the CSIRO, the software allows aerology conditions to be mapped in high resolution and the development of virtual wind farms. This allows the energy developer to assess the viability of projects, as well as optimise their configuration to increase returns. In addition to the above, co-founders Dr Nathan Steggel and Dr Keith Ayotte are both in senior leadership technical roles. They are paid fixed packages of $215,000 and $185,000 respectively, with each eligible for an STI bonus of 40% p.a. Both founders have extensive experience in the wind industry, with Dr Steggel the lead developer of Windscape. Other senior management includes CFOO, Rob Fisher, and MD Africa, Peter Venn. Details on their experience and salaries can be found in the prospectus. 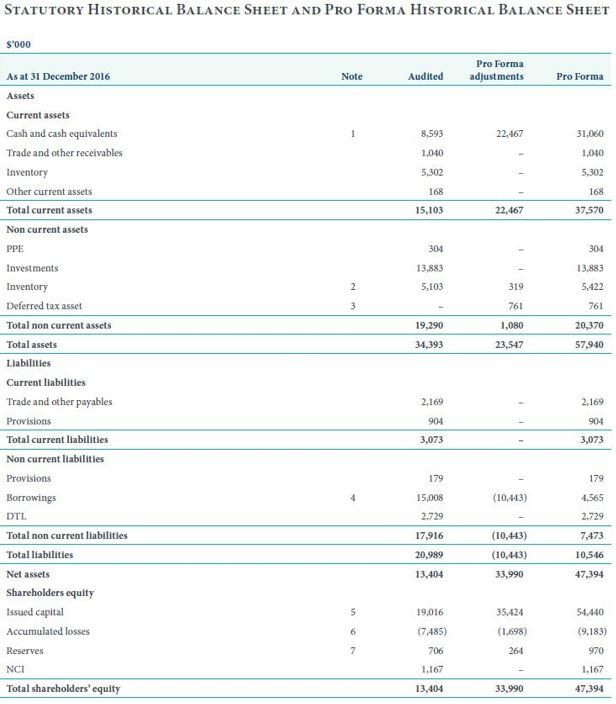 Figures 7 and 8 show the business’ capital structure before and after the IPO, first on an undiluted basis, and then fully diluted. On completion of the IPO, there will be 2,612,000 options issued under the Employee Share Option Plan. Their exercise prices range between $0.465 and $0.75. There is a new Employee Share Incentive Plan, plus various convertible notes and warrants detailed further in the prospectus. Figure 9 displays the securities subject to voluntary escrow arrangements under the IPO. On an undiluted basis, Windlab’s free float will be 48%. Over a period of 4 years, Windlab has increased its recurring revenue from 0.8% to 13.5%. In the same period, EBITDA margins have risen from 27.1% in FY14, to a forecast of 63.1% in FY17. 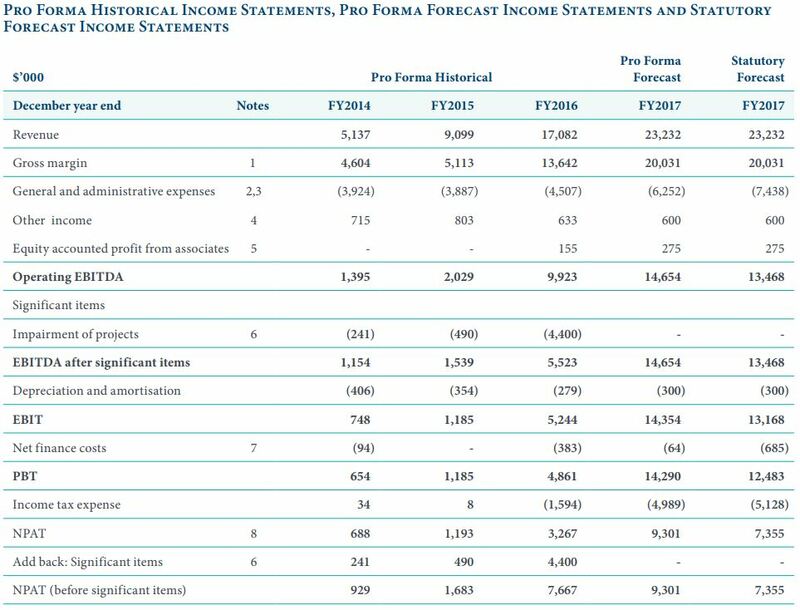 For the financial year ending December 31 2017, pro forma revenue is expected to increase 36%. On an undiluted basis, and pro forma forecast EBITDA of $14.7m, the company’s enterprise value/EBITDA ratio for FY17 is 7.4. Following the IPO, forecasts show cash reserves of $31.1m plus operating cash flow generated. Directors do not intend to pay dividends for the foreseeable future. Financial close of Phase 1 of the Kennedy Energy Park is seen as a major financial milestone. 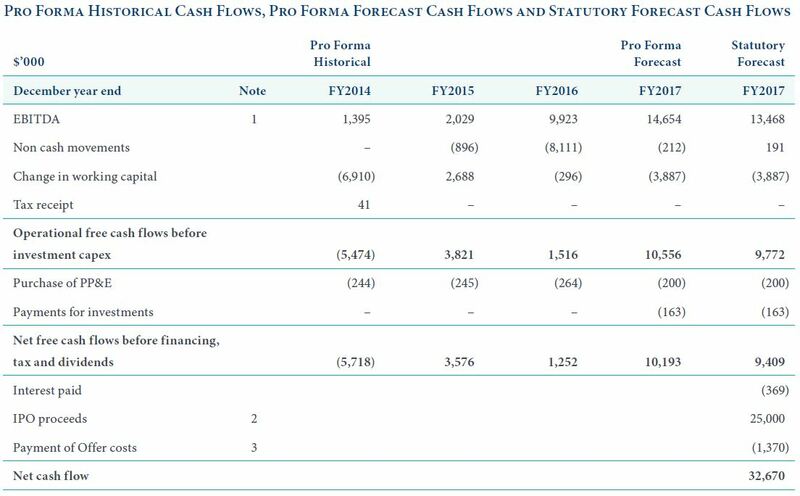 If the project does not reach financial close by end FY17 (December 31, 2017), pro forma EBITDA will reduce by $5.3m. The information contained on this website in no way reflects the opinions of IPO Society. It is provided for informational services only. It does not constitute an offer to sell or a solicitation to buy any security or other financial instrument. The information is general in nature and does not take into account your personal situation. You should consider whether the information is appropriate to your needs, and where appropriate, seek professional advice from a financial adviser. Detailed information may be needed to make an investment decision, for example: financial statements; a business plan; information about ownership of intellectual or industrial property; or expert opinions including valuations or auditors’ reports.